Carving Knife and Fork Sets are generally not included in even the best knife sets or knife blocks, and are often the top choice among home cooks for a Christmas gift, wedding present, birthday present, or holiday or Easter dinner ensemble. And when the holiday season approaches, with Thanksgiving Dinner and Christmas dinners on the horizon, many of us turn thoughts to having a good carving knife set to carve the perfect turkey, ham, prime rib, or roast for our holiday dinner. And to be honest, I strongly recommend a carving set rather than just a carver. An effective carving knife really needs a well-designed meat fork to balance out the carving chore. I’ve even heard of people buying a carving knife set just to get a great meat fork. How Did We Choose Our Top 5 Carving Knife Sets? In order to find you the best carving knife and meat carving fork, we’ve sorted through a large number of brands, knife lines, and characteristics to find you the best carver sets. We gave prominence not based on price or brand recognition, but for the quality construction needed to make a long-lasting knife set, the best balanced knife and fork, the knife set’s overall functionality, and most importantly, the sharpness and slicing capability in the knife. The Wusthof Classic Carving Set is our top rated carving set for a few reasons. It provides the best mix of brand, quality, price, and sharpness that we found among all of our candidates for best carving set. Wusthof’s manufacturing process for the Classic line is among the best rated in the world, with solid test results in competition and side by side reviews. It beats out even the Shun lines for sharpness, with the edges ground to 14 degrees on both sides, compared to a slightly less 16 degrees for the Shun carving knife set. Ranked #3 in Carving Knives at Amazon, with a 5.0 Star Rating on 17 reviews, we aren’t the only ones to like this carving set. This carving knife is designed with a Granton edge, often referred to as a hollow-ground edge. This adds slight scalloped bubbles in the knife’s edge, preventing food from catching on the knife, which can provide a smoother slice than other blade types. Wusthof has designed a carving knife that reviewers claim has near perfect heft and balance, making your carving task easier and less of a strain on your hand and arm. And the fork is 6″ long and slightly curved, which improves your handling of the meat after slicing. With its extremely sharp edge, your turkey slices will be extremely thin while the blade maintains enough heft to handle larger cuts of meat just as easily. Who Should Buy This Wusthof 2-Piece Set? Thanks to the slightly lower price compared to other similar options, this fits the budget a bit better than some, and its features give you an exceptional carving set. 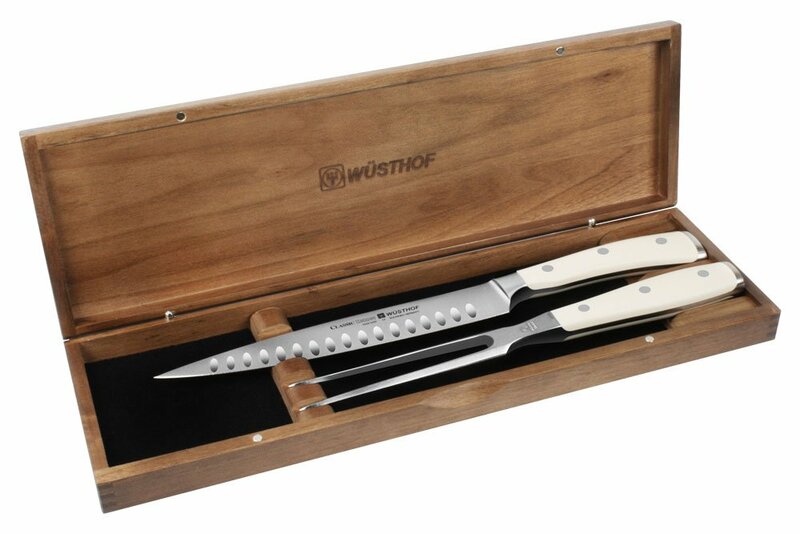 And if you would like a presentation box in order to give a carving knife set as a gift, you could take a look at the Wusthof Classic Ikon Creme Hollow Edge set, which comes with a gorgeous Walnut case. You can also find this Classic Ikon carving set with black handles here. The Shun Classic 2-Piece Boxed Carving Set is our solid #2 rated set. While not quite as sharp as the Wusthof carving knives, this Shun knife set is a quality offering. 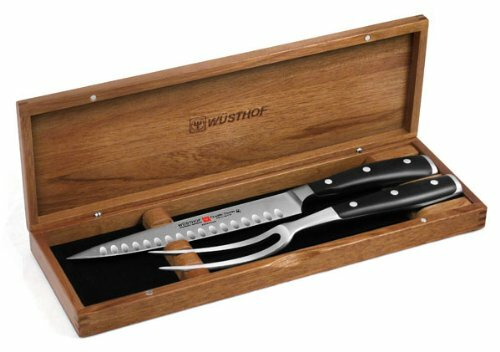 Like the Wusthof set, it has an 8-inch carving knife with a 2-prong carving fork. I also like the presentation and look of this set, with its Damascus-style finish and beautiful presentation box. As a Christmas gift or wedding present, this Shun carving set has a lot to offer with the presentation and storage box. Shun has done a solid job designing this boxed set, with a comfortable D-shaped handle and the Damascus look to the blade without the rusting problems experienced by a true Damascus steel blade. And if you prefer the lighter Shun knives over the heft of a Wusthof blade, this carving knife is probably the sharpest you’ll find compared to most European knife sets. Like the Wusthof Hollow-Ground Set above, this Shun set has a 4.0 Rating on Amazon, although with only 5 reviews as yet it may rank upwards soon based on the reviews I’m seeing. The Damascus style blade reduces drag on the knife’s slicing performance by creating microscopic air pockets built in during the cladding process. Combined with the knife’s sharpness, you’ll get an excellent carving slice. I think the presentation and foam insert storage box here is a plus. Storing a carving knife set properly requires a little something extra — a storage box, knife sheaths or guards, or a knife block that can handle the size of the carving knife and meat fork. Who Should Buy This Shun Classic Boxed Carving Set? While I do love that box, it prices this set a lot higher than the comparable Wusthof sets in our Top 5 Carving Sets list. But if you are shopping for a gift, the Shun knife and meat fork here may be the best fit for you, and it is an equally solid offering. And if you would prefer a longer carving knife, you can take a look at the Shun Premier 2-Piece Boxed Carving Set (rating 4.9 at Amazon), which costs a little more, but gives you the same performance and presentation with its 9.5-inch carving knife. You may wonder why I’d choose the Four Star 2-Piece Carving Set instead of a Four Star II set for our #3 choice in top carving knife and fork sets. Basically it comes down to two things: better reviewer ratings and a far more reasonable price for what you get. Like the Wusthof Classic, this Henckels carving set doesn’t include a storage box, but given its slightly more “budget” pricing, that makes sense. If what you really want is a reasonably-priced set, the J.A. Henckels carving knife set is worth considering. Manufactured in Germany, using the same kind of excellent blade steel as Wusthof knives, Zwilling uses their SigmaForge and Friodur ice hardening to produce an excellent knife set. With bonded handles, full tang knives, and laser-controlled sharpening, this is a well-made carving knife and meat fork. With a 4.8 rating on Amazon, it’s definitely worth a look. If you like the German knives and their construction, ergonomic handles, and balance for your kitchen knives, but prefer a lighter blade like the Shun set, you’ll appreciate this knife and fork. The Henckels carving knife produces wonderfully thin slices, but the real find here is the meat fork. With its length and design, you’ll love moving your turkey from sliced bird to serving plate. Who Should Buy This J.A. Henckels Zwilling Four Star 2-Piece Carving Set? I wanted to provide at least one somewhat budget-minded option that still offers an excellent carver and fork. I think this was the best of those options, and it appears that the meat fork may be an even better find than some of the other choices here. The Wusthof Classic Carving Set is the straight-edge blade version of our top rated carving set. Like its friend chosen as the best-rated carving knife set, it provides the solid quality of the Wusthof Classic line and best blade sharpness that we found among all the sets we reviewed. While it only shows a 4.6 Star Rating on 11 reviews, its rating really is skewed by a 2-Star review. Apparently the reviewer was unhappy that they got the wrong knife set in their order too close to Thanksgiving. And rather than return it, they gave the carving set (that they kept) a 2 star rating. My feeling is that this distorts the rating downward to some degree as they had no complaints about the knife set in general. The carver is designed with a straight edge. Often a straight edge blade provides an extremely smooth slicing experience with most meats because it doesn’t catch on meat fibers. Wusthof’s carving knives, like pretty much all the reviews I’ve seen on the Classic line, are lauded by reviewers as nearly perfect in their heft and balance. And this carving fork, like our #1 choice, is 6″ long and slightly curved to improve meat handling. Who Should Buy This Wusthof 2-Piece Straight-Edge Set? Like the Hollow-Ground version, this is your best option for a seriously sharp carving knife and useful meat fork. It’s a little more expensive than the Hollow-Edge, which is why I ranked it lower in this list. And if you’d like to have a presentation box for a gift or for storing your knives, you can take a look at the Wusthof Classic Ikon Creme Hollow Edge set, which comes with a gorgeous Walnut case. The Classic Ikon line is somewhat more expensive, but it still falls in line with the Shun line carving knives and their presentation boxes while being slightly sharper. The Zwilling Pro Carving Set is our #5 choice for top carving sets. Other than price, the reason it rates #5 is simply the lack of good reviews. With only 6 reviews, the 4.8 Star rating is just a tad uncertain, but nearly 85% of the reviews are 5 Star and the others are all 4 Star, so I’d trust the overall rating myself. This Pro set has the same solid German manufacturing as the #3 Four Star set, and has a forged blade, contoured and arched bolster and ergonomic handle for comfortable use. The 8″ slicing knife has a straight edge for smooth slicing with most meats because it doesn’t catch on meat fibers. Henckels blades tend to need additional honing to keep their sharpness, so I recommend solid honing before tackling your holiday dinner turkey, roast, or ham. German manufacturing tends towards knives with solid heft and handling, and this knife is no exception. If you prefer a lighter carving knife that is still well-balanced and a little thicker than Shun knives, this may be the best brand for you. Who Should Buy This Zwilling Pro 2-Piece Carving Knife and Fork? With a mid-range price, German quality, and solid performance, I think this is an excellent choice if you want a German carving set that is a little lighter-weight than the Wusthof lines. All of these carving knife and meat fork sets are top-rated carving sets to consider for yourself or as a gift. I can say that the Wusthof brand knives seem to have the most reviewers where people mention buying for one person and then buying again and again as gifts. If you like the solid heft and balance of the German knife offerings, combined with the incredible sharpness of the Wusthof Classic line, I’d definitely suggest either the Classic Hollow-Ground or Straight Edge 2-Piece Carving Set. If your main purpose here is to find a carving knife set for a gift, I’d go with either the Shun Classic or Premier Sets, or take a close look at the Wusthof Classic Ikon carving set. Lastly, if you are looking for a lighter-weight carving set, you’d probably be most interested in the Zwilling Carving Knife Sets (Four Star or Pro) on the budget end or the Shun Carving Sets on the higher end of the budget scale. Which carving knife set is your favorite from above? Or do you have another brand or set that you like even more? Share with us and leave your comment below. 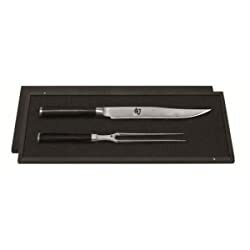 One Response to "Top 5 Carving Knife and Fork Sets For Thanksgiving and Christmas Holiday Dinners"
Shun DMS200 Classic 2-Piece Boxed Carving Set needs to be sharpened if regularly used so I think I will choose another.